On Sunday, January 22, 2017, the new US Postal Service (USPS) postage rates and rules go into effect, so mailers need to take action now to be properly prepared. For most mailers, the first day of mailing under the new rates will be Monday, January 23, 2017. As we wrote back in October, the rate case included good news for Commercial First-Class Mailers. The further clarification by USPS senior management on the rebranding of “Standard Mail” to “USPS Marketing Mail”should alleviate most concerns by organizations using that class of mail. We discussed these and other aspects of the rate case in our recent webinar. If you haven’t already, send an announcement to your customers. If you manage a corporate mail center, that means the departments you service. The notice should include an explanation of the new rates, and how the rates will impact your customers’ costs. Provide a chart on the new retail rates, and explain how the rates will impact personal mailings, such as bills. Also, include ideas on how your customers can take advantage of the “extra ounce” available for automated, presorted mail. By providing this type of information, you reinforce your image as the expert on postal affairs, and that you add value to the process. Meet with local USPS representatives, including the acceptance unit. Review the changes with the new sortation rules and postal statements. If possible, meet with the Business Mail Acceptance unit manager or supervisor. Ensure that everyone is on the same page with any changes. Prepare to implement all the changes at the end of the day on either January 20 (Monday through Friday operations) or January 21 (Monday through Saturday operations). Download and install meter and software updates. Post reminders around your mail center about the new rates. This includes putting printed notices at the meters, the inserters and the customer service desk. For corporate mail centers, also post reminders at internal mail stops. Replace all internal and postage statement forms. On Monday, January 23, send out another notice to your internal and external customers about the rate change. At the daily huddle with your employees, remind them about the changes and answer any last-minute questions. Inspect every meter to make sure the settings are correct, and review the testing the programmers completed on the software updates. Conduct additional quality control checks throughout the day. 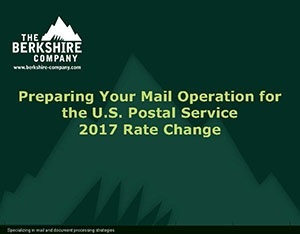 To assist mailers with these changes, The Berkshire Company has published a new e-book, “Preparing Your Mail Operation for the U.S. Postal Service 2017 Rate Change”. This free resource, which includes an implementation checklist, is designed to help managers ensure a successful transition to the new postal rates.